If your child has been diagnosed with amblyopia (“lazy eye”), wearing an eyepatch may be necessary. The principle is that by blocking the vision of the better-seeing eye, the visual system in the brain related to the worse-seeing eye will have to work harder. Since a young child’s brain is very “flexible”, the vision can improve with more practice. While wearing an eye patch may seem like a silly little thing to do, two guys actually won a Nobel Prize for figuring out the neurophysiologic basis for patching! Patching is sometimes also used to help manage strabismus (eye misalignment). In either case, proper wear is essential for an eyepatch to work effectively and efficiently. The ophthalmologists at Pediatric Eye Care of Maryland have extensive experience in treating vision problems that require the use of an eyepatch and can be trusted to provide honest and helpful guidance for whatever issue your child’s vision problem. With 4 convenient locations in Baltimore, Clarksville, Westminster, and Eldersburg, we are the only multi-location vision center in the greater Baltimore area with multiple MDs on staff. There are a variety of eyepatches to choose from. The classic “pirate” patches are best avoided as they generally do not fit snugly enough keep a child from peeking and also do not fit well over or under glasses. Instead, adhesive-backed patches are usually the best option. These are essentially like a large band-aid that fits over the eye. 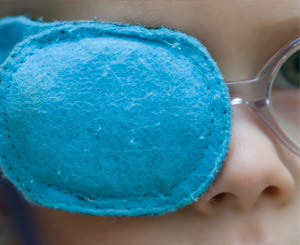 Because they adhere in place, children cannot move these eyepatches to see around them. Adhesive patches should always be worn underneath eyeglasses and should never be adhered to the glasses themselves. Cloth (or “sock”) patches are another option: These fit over the lens of your child’s glasses. A cloth patch will only work if your child wears eyeglasses that fit snugly. A third option is sometimes to put a “filter” over the lens of the better-seeing eye, which does not totally block vision but blurs it enough to achieve the goal of improving the other eye. Finally, atropine eye drops may sometimes be used. Your doctor and you will discuss the best option for your child if such a treatment is needed. You can buy the necessary patches at our offices, but can of course also “shop around”. Many drug stores and groceries have them (look for “orthoptic eye patches”), although these are often the band-aid colored type (such as Nexcare) and many children respond better to the type with colorful designs. A few places online to buy patches are Ortopad, PatchPals, and MYI Eye Patches. Unfortunately, even though patches can restore vision to a child, insurance companies usually do not cover them (despite us trying!). Some parents opt to use a Flex Spending Account. How can I encourage my child to wear their eyepatch? An eyepatch must be worn consistently in order for it to work, so it is critical that wearing the patch becomes part of your child’s daily routine. Purchasing patches that are decorated with eye-catching designs and popular characters can help encourage your child to wear them. You may also want to distract your child with a reward they’ll enjoy, such as allowing them to watch a favorite TV show or video game to help keep their mind off the patch. As your child adjusts to their eyepatch, it is important to monitor them to ensure they do not remove it when you are not looking. There are also many children’s books available that address patching and can make it more comfortable and normal, thus helping your child adjust. You could also consider creating a patching calendar: Simply purchase or create a calendar and encourage your child to decorate it with a sticker each day that they wear their eyepatch. When they successfully complete their calendar, reward them with a prize. There are also several children’s books about patching that you may find useful when discussing the patch with your child, such as Jacob’s Eye Patch or The Patch.